The first trading day of 2018 brought the robust price of silver of $17.06 an ounce, and the outlook for the white metal steadily improved as prices shot to $17.52 by January 25. But, as was the case with other precious metals and major stock market indexes across the globe, silver’s fortunes shifted, causing prices to slump to $15.47 by December 31. Silver prices are climbing once again, notching three straight days of gains during the first week of the year. Will the much-anticipated silver rally hit in 2019? Across the board—from banks to financial market analysts—2019 is predicted to be a banner year for silver prices. Investors, miners, and analysts expect 2019 to be a bright year for silver. A poll of delegates at the London Bullion Market Association in Boston last October set silver prices at $15 an ounce by the fall of 2019. Just a note: the white metal has already surpassed this prediction, hitting $15.71 on January 4, 2019. Analysts at precious metals and financial market forecasting firm, Investing Haven, indicate silver prices could rise to between $17 and $26 an ounce. The founder of the Hetch Commodity Report, Andrew Hetch, predicts renewed investor demand will drive the price of silver to $17.37. Researchers at the commodity market analysis group Capital Economics predict the white metal could fetch $17.50 an ounce this year. Peter Krauth, a resource specialist at financial news website Money Morning, expects a price range of $18.50 to $21.50 for silver in 2019. News and financial forecasting site Focus Economics analysts see silver shooting to $19.20. The Economic Forecast Agency (EFA) predicts a yearly high of $19.57 for silver. Todd “Bubba” Horwitz, of bubbatrading.com, sees silver outperforming other assets this year at $18 to $20 an ounce. Lawrence Williams, former CEO of Mining Journal, expects the price of silver to rise to $20, as well. CEO of First Majestic Silver, Keith Neumeyer, foretells exceptional performance for silver, with prices skyrocketing to $130 in the near future. Big banks see strong market support for the white metal in 2019. Bullion market analysts indicate positive investment sentiment and solid industrial demand will likely push silver prices higher in 2019. What will account for this shift in investor attitudes? Which sectors are predicted to consume the most silver? Many of the same market conditions that garner demand for gold also spur silver buying. This is largely because precious metals have been historically viewed as safe havens during times of political, financial, and economic uncertainty. Analysts assert that many of the circumstances that triggered the gold and silver rallies in 2010 and 2011 have returned in full force this year, suggesting prices could soar soon. Some analysts view the congenial exchange between President Trump and President Xi Jinping at the recent G20 summit as a sign of waning trade tensions. Improved trade relations could prove beneficial for silver prices if they result in an uptick in industrial demand from China. Given Apple’s recent reduction in sales forecasts due to China’s slowing economy and market volatility in the U.S. and globally, it’s difficult to see Trump and Jinping dragging the trade war out much longer, especially with the 2020 U.S. elections on the horizon. Early January 2019 trade talks between representatives for the two countries reportedly went well. Whether wishful thinking or pragmatic predicting, market participants have been calling for an end to the Federal Reserve’s cycle of interest rate hikes throughout 2018. The new year brought the most dovish statements from Fed Chairmen Jerome Powell we’ve heard yet: at a Fed Chair reunion on January 4, Powell said “the central bank is ‘prepared to adjust policy quickly and flexibly’ [and that the] balance sheet ‘normalization’ is up for adjustment’” too. Silver is one of the most negatively correlated assets to the U.S. dollar. This year should be outstanding for the white metal because predictions of a dollar crash abound. Mike McGlone, a commodity strategist at Bloomberg Intelligence, says the dollar is peaking and silver bottoming, which means a trend reversal in 2019 is highly likely. Stock indexes, currencies, and bonds in emerging markets should improve in 2019, according to Goldman Sachs. With the dollar expected to weaken and EM currencies to strengthen, investors in these countries will likely have greater purchasing power for silver and other precious metals. The U.S. Bureau of Labor Statistics Annual Inflation Rate, the Consumer Price Index, and other gauges that measure inflation have been climbing in recent years. While paper currencies can lose value during periods of inflation, silver and other precious metals have proven a store of wealth and are therefore viewed as inflation hedges. On January 3, the Treasury Department reported that the U.S. national debt has surged to $21.974 trillion, 2 trillion of which has been added since President Trump took office. Public debt accounted for 78 percent of the country’s gross domestic product for fiscal year 2018, levels not seen since 1950. Worse, thanks to the Tax Cuts and Jobs Act, it is projected to hit 96 percent of GDP by 2028. From 2017 to 2018, the national deficit increased from 3.5 to 3.8 percent, indicates the Congressional Budget Office. Analysts at Dutch bank ING expect trillion-dollar deficits in both the government’s current account balance and budget balance throughout the next four years. This swelling twin deficit should help push the dollar to its peak. Once the greenback starts its decent, expect silver demand to rise as foreign investors snap up the shiny metal. economists’ warnings that the record-long bull run was “too good to be true.” Sentiment shifted quickly last fall when extreme volatility rocked the markets. Fears of the coming recession, the Fed’s tightening of monetary policy, rising inflation, and political uncertainty under the Trump Administration and split congress rattled investors. Only eight times in its history has the Dow swung 1,000 points in a single session; five of them occurred in 2018. 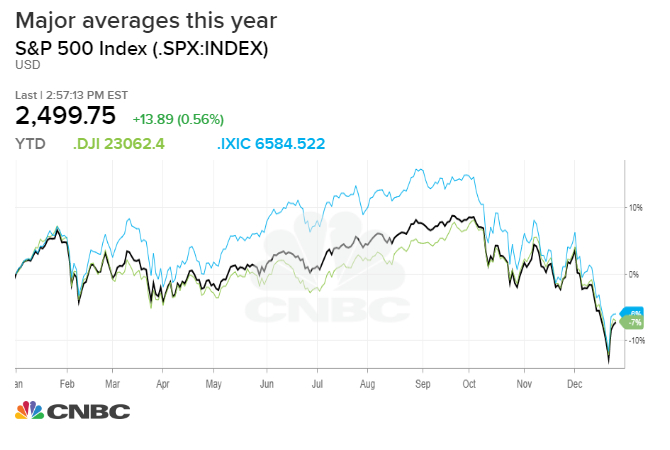 For as much as investors touted gains last year, the stock market lost—and a lot. The S&P 500 dropped 6.2 percent, the Dow 5.6 percent, and the Nasdaq 4 percent. 2018 was the worst year for stocks since 2008. The market hadn’t seen such a bad December since 1931. There is, however, an upside to extreme losses in equities prices: a silver rally! 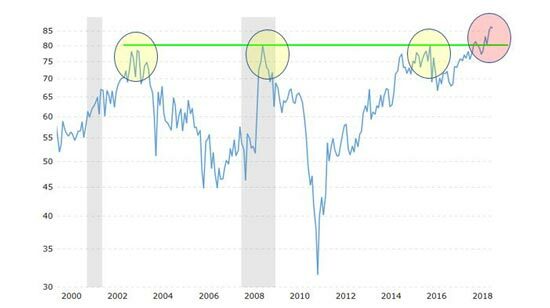 Floundering equities, flattening bond yield curves, and slumping corporate profits all signal that the next recession is swiftly approaching. But what about that strong jobs data? In December 2018, wages increased, and employers added the most workers in 10 months. These are the exact signs of an overheating economy that usually quell fears of a downturn. Unemployment and similar measures typically peak and then drop, blindsiding forecasters when the economy suddenly crashes. An uncertain economic picture historically has benefited prices for safe haven assets, such as gold and silver. Increasing fragmentation in the European Union, cyberattacks, international trade disputes, souring US-China relations, and conflicts between Russia and NATO will pose the largest threats to the global equilibrium in 2019, predicts BlackRock, a global investment management firm in New York. Some of the factors set to push prices higher this year are unique to the silver market. Silver prices will outperform gold prices in 2019, predict commodity analysts at Capital Economics. Why? The gold-silver ratio. It’s a measurement of how much silver it would take to purchase one ounce of gold. Throughout history, the gold-silver ratio has averaged around 50 points. In 2018, the ratio hit a high of 85; that’s the cheapest silver has been compared to gold in the last 20 years. In the past when the gold-silver ratio surpassed 80, it reversed significantly: in 2003, silver prices skyrocketed 61 percent over a nine-month period of time; in 2008, they soared by an astounding 128 percent in only 11 months; and, in 2016, they corrected 28 percent in a mere 4 months. Experts except a similarly impressive reversal in the gold-silver ratio to take silver prices up, up, and up this year. Last year brought several indications that prices for silver have bottomed. First, there’s silver prices: they dipped below $14 in September, the greatest decline in two and a half years. Second, instead of buying silver and holding onto it, many investors bought and sold back their silver. For the first time in years, precious metals dealers were buying back more of the white metal than they sold. Third, recovering mining production resulted in a surplus of silver in the market, which also weighed on prices. When prices bottom, it’s often a sign that they’re set to reverse. Price bottoms are an excellent time to purchase silver before prices start climbing, which we’re already seeing happening in 2019. See live silver spot prices here. Analysts’ predictions for a silver price breakout this year are largely anchored to positive expectations for the price of gold. Historically, when gold starts a bull run, silver follows. ‘If you are bullish on gold you should be bullish on silver,’ urged the president of Blue Line Futures, Bill Baurch. Bernard Dahdah, a precious metals analyst at Natixis, indicated that silver is 1.3 percent more volatile than gold. When gold prices increase, so too will the price of silver. Dahdah even predicts silver to outperform gold. Gold prices have been rising, gaining more than $50 in December 2018 and steadily climbing at the start of 2019. While supply and demand largely determine both gold and silver prices, the drivers of demand for each precious metal are distinct in many aspects. This is because industry accounts for nearly 60 percent of the demand for silver. An excellent conductor of electricity and far less expensive than gold, silver has widespread applications in numerous industrial sectors. Not only has mine output been decreasing in recent years but also operations at some of the world’s biggest producers are under threat. ‘We’re consuming, as a human race, over 1 billion ounces of silver annually, and miners are only producing about 800 million ounces a year, and that’s been dropping for three consecutive years,’ explained the CEO of First Majestic Silver, Keith Neumeyer. Mexico is the top producer of silver in the world. Silver output from the country was expected to increase, but that might not be the case under the newly elected government. Under proposed legislation, spills resulting in public health risks or environmental damage could be grounds for government expropriation of the entire mine. Areas where mine exploration could trigger social conflict could be off limits under another proposal. The proposition of stricter regulations for mines in Mexico alone could serve as a deterrent for investors, ultimately curbing output from the country in coming years. Then there’s the fact that 70 percent of the silver produced across the globe is a byproduct of other mining operations: 22 percent comes from copper mines and 34 percent from lead and zinc mines. Prices for these base metals have suffered lately, which means operations could be scaled back, resulting in less silver in the near future. Moreover, rising silver prices would be unlikely to compel miners to ramp up production, as the white metal isn’t the focus of operations. The electronics and automotive industry are expected to spur significant demand for physical silver this year. David Holmes, the senior vice president of Heraeus, a German-based refining group, predicts “’explosive growth’ to come from auto-sector demand for silver as the world shifts away from internal combustion engines.” By 2020, Refinitiv, formally Thomson Reuters, estimates more than fifty percent of automotive demand for silver across the globe will come from electric and hybrid-electric vehicles. Smartphones will also account for a large proportion of silver usage. In 2018, 16 million ounces of silver were used in the production of smartphones. While developed markets are becoming saturated, emerging economies, particularly India, should generate noteworthy silver consumption. Close examination of the factors that influence silver prices point to a rally in 2019. The coming economic downturn, market correction, and continued geopolitical risks all make now the time to secure investment portfolios with safe haven assets. Prices for precious metals are already rising in the face of diminishing supplies. If you’re looking for a deal on portfolio protection, silver is your best bet. The white metal has been slowly following the price of gold upward, but there are still bargains to be found before silver prices breakout. Learn more about investing in gold and silver and how to set up a silver IRA.